at TheWrap’s Power Women Breakfast in Washington,D.C. “I think our generation has taken our rights for granted,” she said, speaking beside author Margaret Atwood at the W Hotel across from the White House in Washington, D.C. “The idea that they would be taken away didn’t occur to us for a very long time. And I think that for sure there’s a rise in my generation of feminism. The wave is coming back as we’re faced with things being taken away from us that we thought we would always have – reproductive rights and all that. For me I’ve definitely become more aware and more active in the last few years.” stated Elisabeth Moss during TheWrap’s Power Women Breakfast, an all-female panels discussion held on Wednesday April 19, 2017 in Washington, D.C. I was hoping to get a moment to watch the anticipated series premiere of Hulu's The Handmaid's Tale this past weekend, the theme of a future United States run by a male totalitarian society, doesn't seem all that far fetched in light of the current Administration. In fact, it's no wonder Atwood's 1985 best-selling novel “The Handmaid’s Tale,” has seen sales soar since the election of President Trump. We must be hopeful nothing so dire should occur; yet ever vigilante. Therefore, this show has definitely moved to the top of my viewing schedule. The Handmaid's Tale (Hulu Original Series): Adapted from the classic novel by Margaret Atwood, The Handmaid's Tale is the story of life in the dystopia of Gilead, a totalitarian society in what was formerly the United States. Facing environmental disasters and a plunging birthrate, Gilead is ruled by a twisted fundamentalism in its militarized ‘return to traditional values'. 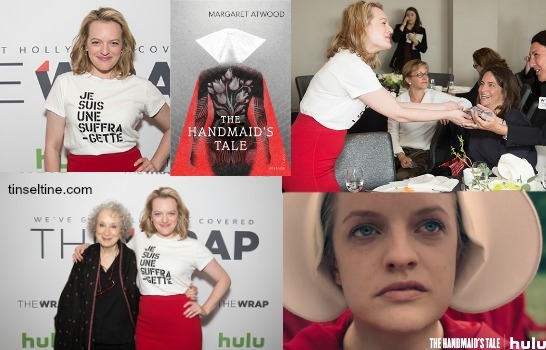 As one of the few remaining fertile women, Offred (Elisabeth Moss) is a Handmaid in the Commander’s household, one of the caste of women forced into sexual servitude as a last desperate attempt to repopulate the world. In this terrifying society, Offred must navigate between Commanders, their cruel Wives, domestic Marthas, and her fellow Handmaids – where anyone could be a spy for Gilead – all with one goal: to survive and find the daughter that was taken from her. If you're wondering - true, this post doesn't fit under the topics of Film, Food or Philly, but when I was sent a press release and materials from the event, and loving Mad Men as I do, and Hulu, I thought it would make a good post to share with my readers.